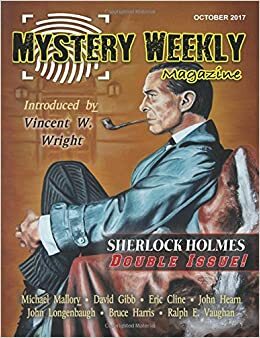 "The Mechanical Detective," by John Longenbaugh, in Mystery Weekly Magazine, October 2017. 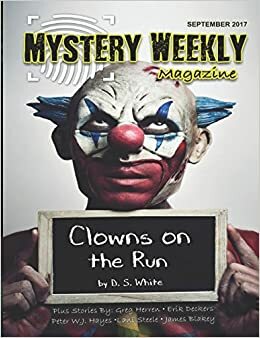 The more observant among you may be wondering why I am reviewing a story in the October issue of Mystery Weekly Magazine when last week I covered a tale from their November issue. The answer is that I am a wild soul, a born free spirit who scorns chronological order. Ha ha! Sorry. Where was I? Oh, yes. Another thing I scorn is fan fiction, where a person attempts to add another story to someone else's ouevre, either taking advantage of public domain, or with permission of the heirs, or just hoping that they will never notice or care to sue. Not fond of those stories. But I sometimes enjoy what I call a pastiche in which the writer uses elements of another writers world to create something different. Heck, I have even indulged in that game myself. And so has Longenbaugh. In his world it is 1889, eight years after the Great Detective (unnamed, but you-know-who) has arrived on the scene, and London is stinky with consulting detectives, each with their own gimmick. Allow me to introduce Ponder Wright, the Mechanical Detective. Wright is not truly mechanical but rather what we would call a cyborg, having had various parts of his body replaced by machinery after an accident. This was due to the kindness of his wealthy and influential brother. "I daresay my soul is my own," he notes, "but far too much of the rest of me is merely leased from Mordecai." He says this, by the way, to his roommate and biographer, Danvers, who is a "mechanical surgeon,"
fully human, but skilled at repairing delicate bio-gadgets. In this story Wright has been summoned to examine the case of a professor who has apparently been killed by one of his automatons. But these robots can only do what they have been programmed to do. Has the War Department violated treaties by asking the professor to build killing machines? Or is there another explanation? One thing that requires an explanation, of course, is how steam-powered London possesses such advanced machinery. Longenbaugh offers one which requires more suspension of disbelief that Ponder Wright's solution to the mystery, but I enjoyed it all. This is a fun piece of work. "The Last Evil," by David Vardeman, in Mystery Weekly Magazine, November 2017. Hooboy. What to say about this week's entry? It reminded me of Shirley Jackson, John Collier, maybe some shadowy corners of Flannery O'Connor and even James Thurber. In other words, we are in the strange part of town. Our protagonist is Mrs. Box, who believes that suffering is good for the soul. Hence she wears flannel lined with canvas, because parochial school taught her "the value of chafing." She also believed in doing "a lot of good in the world. But there was another tinier but just as important point, and that was to get the leap on people. In her own life she felt a lack of people leaping out at her. In the past forty days and forty nights, not one soul, nothing, had given her a good jolt. Mr. Box certainly had not." Which is why she keeps a live tarantula in her purse, which she pulls out to shock people. As a good deed. Or does she do that? One thing she does do is meet a man on a train who has something in his briefcase even more frightening than a live tarantula. Or does he? Enough. Read the thing and find out. It's worth the trip. "Precision Thinking," by Jim Fusilli, in Ellery Queen's Mystery Magazine, November/December 2017. Last week I wrote about a story that felt like it belonged in Black Mask Magazine. By coincidence I am now covering a story that appears in the Black Mask department of Ellery Queen. Go figure. World War II has just started and the German owner of Delmenhorst Flooring has just died. The business is in Narrows Gate, a fictional town which strongly resembles Hoboken, NJ. The Farcolini family decide to take over the flooring business, replacing the German employees with "locals, mostly Sicilians and Italians who couldn't spell linoleum on a bet but had a genius for theft." It's a cliche, I suppose, that gangsters take a successful business and turn it crooked, even though it was making good money on the up and up, because they can't imagine not doing it crooked. See the fable of the scorpion and the frog. But in this case there is a low-level mobster who discovers he likes laying linoleum, and he's good at it. Can he find a way to keep the crooks from ruining a good thing? Fusilli captures the tough guy tone perfectly, in a fun tale. "The Black Hand," by Peter W.J. 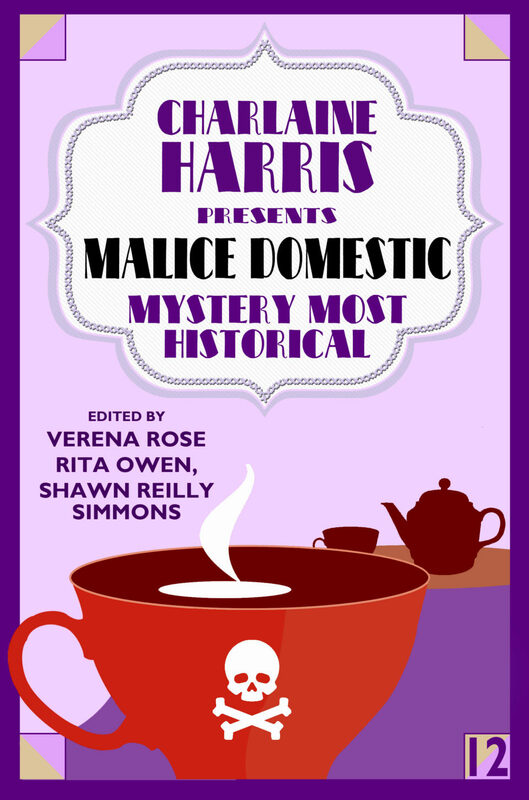 Hayes, in Malice Domestic: Murder Most Historical, edited by Verena Rose, Rita Owen, and Shawn Reilly, Simmons. 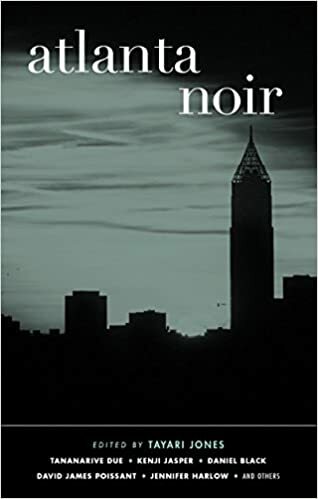 It seems like every year or so I have to chide some editors who don't know what a noir story is supposed to be. Today I feel like I have the same problem in reverse. Sort of. 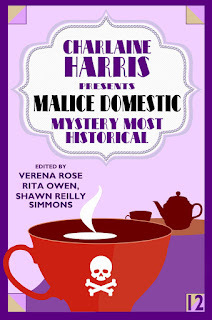 I am not sure of the definition of a "Malice Domestic" story, but I know this one is not what I expected, or what the rest of the anthology (so far) led me to anticipate. Hayes' story is not cozy. It would, on the other hand, would feel quite cozy between the pages of Black Mask, circa 1928, which is around the time it is set. Brothers Jake and David fought over a girl named Bridgid and Jake left Pittsburgh for logging work in the midwest. David became a very successful mobster, until his body shows up in a river. The story begins with Jake coming home to try to discover how his brother died and who is responsible. The first thing he learns is that Bridgid was murdered a few weeks before, and a lot of people think David killed her. Is there a connection between the deaths? Can Jake stay alive long enough to find out? This is an excellent salute to a classic subgenre of pulp fiction. 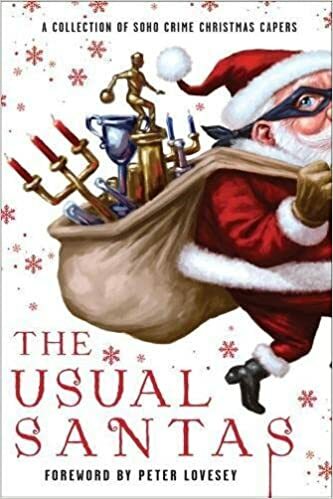 "PX Christmas," by Martin Limón, in The Usual Santas, Soho Crime, 2017. Martin Limón writes exclusively about Asia and most of his novels and stories are set in South Korea in some vague part of the 1970s. His heroes, George Sueño and Ernie Bascom, are investigators for the CID of the American Eighth Army. This story involves two events that come together. The Army decides that suicides brought on by holiday depression are bad publicity so the cops are assigned to collect soldiers suspected of being depressed and making sure they are cared for. "They'll be locked up," Ernie said. Riley glared at him. "Not locked up. They'll be provided extra care. And extra training." And not allowed to leave until after the holidays. Meanwhile the CID has also been ordered to crack down on the black market. Specifically Korean wives of GIs using their PX privileges to pick up subsidized goods which they can then sell. Sueño thinks this campaign has less to do with saving tax dollars and more to do with officers not wanting to see Korean women on the base. It was my job, and Ernie's to arrest these women for black marketing and thus keep the world safe for Colonels and their wives to be able to buy all the Tang and Spam and Pop Tarts their little hearts desired. Neither of these cases may sound like they will result in riots, encounters with a man named Mr. Kill, and tying someone to a railroad track, but our heroes have a way of following a trail wherever it leads. 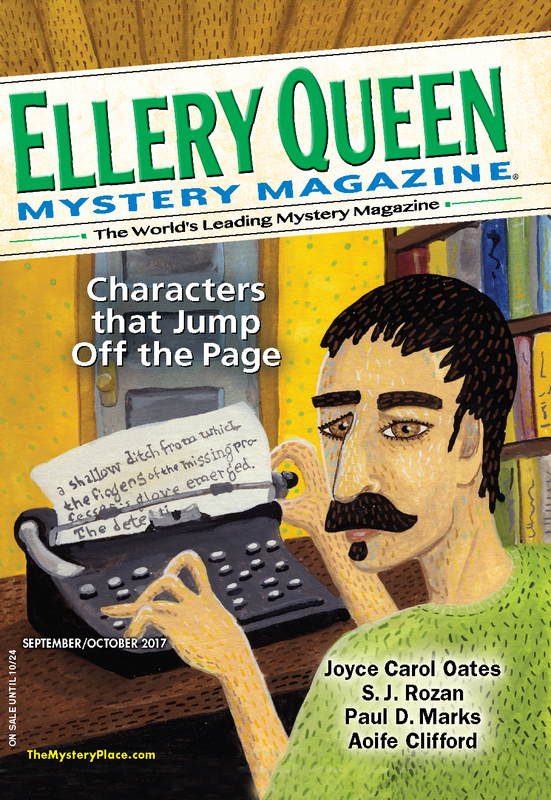 "Making It," by Michael Wiley, in Ellery Queen's Mystery Magazine, September-October 2017. Last week I had the privilege of being on a panel at Bouchercon in Toronto. One of the questions was: How do you find new authors to read? I responded that every new short story is an author auditioning to be your latest favorite. And Michael Wiley certainly did a job here. I will definitely try one of his books. When Skylar Ricks carjacked Gerald Johannson's Ford Taurus on a February morning in Chicago, climbing into the passenger seat at the corner of Granville and Clark, his hand wrapped neatly around a .44 Smith & Wesson, an unlighted Marlboro between his lips, Gerald said, "Oh, now you're in trouble." Well, that took an unexpected turn, didn't it? As the story goes on we will learn the reason for Skylar's rash act and a good deal about the personality of Gerald. He is an older man, missing his late lover, and remarkably imperturbable. Even when being carjacked. Gerald has some definite views on life. Later in the story he offers another character some, well, I won't call it wisdom. Advice. "When a man cares enough about you to shoot your boyfriend, you owe him kindness." Somewhat later Gerald is being pursued on the highway by some bad guys. He manages to get behind them and, rather than escaping, he decides to chase them. "To break their spirit." I don't know what he does to their spirit, but he certainly raises mine considerably. It seems unlikely that there will be more stories about Gerald but I would certainly like to read one. "e-Golem," by S.J. 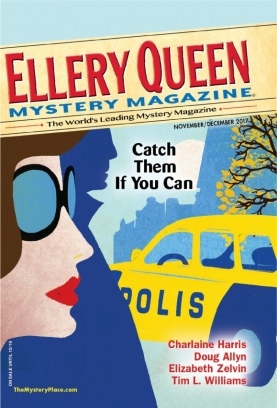 Rozan, in Ellery Queen's Mystery Magazine, September-October 2017. This is the fourth appearance here by my old pal S.J. Rozan, and a doozy of a tale she has chosen to tell. Judah Loew runs a used bookstore on the Lower East Side in Manhattan. Most similar stores have been killed by the Internet but Loew's specialties - including Judaica and mythology - have kept him holding on. Not much longer, alas. But then a newly arrived book claims to offer a spell for creating a golem , the clay humunculus that a medieval rabbi, also named Judah Loew, built out of dust to save the Jews of Warsaw. Of course, the results back in the middle ages were disastrous. 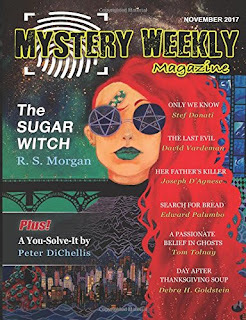 "A Pie to Die For," by Meg Opperman, in Black Cat Mystery Magazine, Issue 1. I have been asked recently about my policy so it may be time to repeat this. Most of the publications I review I either purchase or borrow from libraries. You can send me a free copy of an anthology, collection, or magazine if you want, as long as it is published this year. I promise to start reading each story. If it is the best I read that week I will review it here. First of all, congratulations to Wildside Press for the first issue of their new baby. Long may Black Cat Mystery Magazine prowl the mean streets. This is Opperman's second appearance in my column. It's Thanksgiving and newlywed Annie is supposed to be preparing a feast for her doting husband and his ungrateful mother. But then she gets a phone call from Benedict, who she hasn't heard from since before the wedding. Ah, Benedict, who makes her skin flush and her heart race... He tells her to be at the Palisades apartments in half an hour and she is eager to oblige. And I have to stop there. But, boy, I never guessed what was coming. Nice light writing, lovely ending. 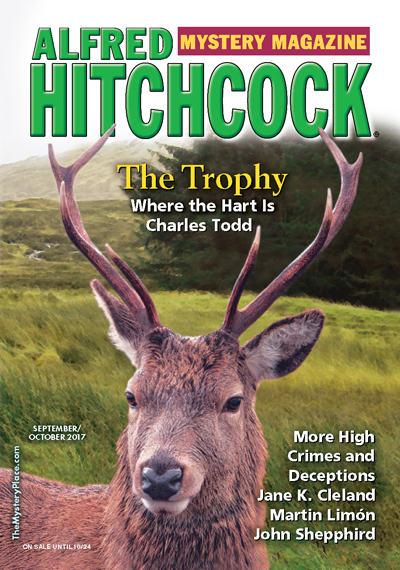 "Do Not Pass Go," by James Blakey, in Mystery Weekly Magazine, September 2017. I admit it. I am a sucker for this sort of thing. Your mileage may vary. The narrator has just arrived in a town and quickly discovers that the cops are corrupt, the wealthy run things to suit themselves, and the employers rip off the workers. Yeah. Thousands of crime stories start like this. What makes this one stand out? And the Parker Brothers run everything. It's like they've got a - What's that word again? 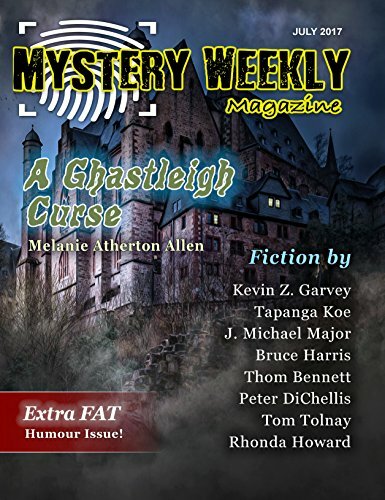 "Publish or Perish," by Kevin Z. Garvey, in Mystery Weekly Magazine, July 2017. Every twist ending is a surprise. Not every surprise ending is a twist. Stories written in second person are not everyone's cup of espresso, double tall skinny. This one works pretty well for me. The main character ("You," obviously) has just kidnapped the editor of a mystery magazine. You are a frustrated unpublished author. Frustrated to the point that you are convinced that there is a conspiracy against you. How else is it possible to explain that no magazines will accept your utterly brilliant stories? You are determined to get to the bottom of the puzzle, even if you have to do nasty things to the editor. What's your long-range plan, though? Well, that's a bit of a mystery. This story won the prize for the week because of the ending which surprised me, but (see first paragraph) was not a twist. Nothing wrong with that, of course. "An End in Bath," by Janet Laurence, in Motives for Murder, edited by Martin Edwards, Crippen and Landru, 2017. Irene Wootten lives a peaceful, quiet life in Bath, ever since her father died. One day an extroverted young man arrives, informs her that he is her cousin Rod from Australia, and he wants to stay for a while. Rather disturbing, but she enjoys his company. More disturbing is the fact that Rod feels his side of the family was cheated out of their inheritance by Irene's father. And worse is her discovery of the assorted crimes that led to Rod's grandfather being pushed off to Australia. Is this a man she can, or should trust? There is a lot more to this complicated and enjoyable tale of family intrigue. "The False Inspector Lovesey," by Andrew Taylor, in Motives for Murder, edited by Martin Edwards, Crippen and Landru, 2017. This anthology is s festschrift, if I may get all librarian-y at you, a tribute by the Detection Club to Peter Lovesey on the occasion of his eightieth birthday. My favorite Lovesey novel is Waxwork, the summit of his Victorian series about Sergeant Cribb. But my second favorite is The False Inspector Dew, about a mild-mannered man who decides to kill his wife and escape disguised as - why not? - the most famous police officer in Britain. So as soon as I saw the title of this story I was prepared to enjoy it. I did. It is England sometime after the war. 1950s, I think? The only thing I know for certain about me is that my name is Margaret Rose, like the Queen's sister. So she has not had the easiest time. But Margaret Rose has dreams. To make them come true she will need to get to London. To get to London she will need money. Enter the new boarder, Mr. P. Lovesey, with "a droopy face like Mrs. Conway-down-the-road's basset hound." He says he is a tax inspector, but Auntie Ag and Margaret Rose, both excellent snoopers, soon have reason to doubt that. A worthy tribute to a master. "What Could Possibly Go Boing? 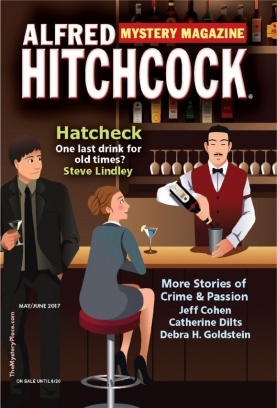 ", by Mat Coward, in Ellery Queen's Mystery Magazine, July/August 2017. Nutty Mat Coward is making his third appearance in this space. This time his characters are the staff of Fake Dog Dirt Etc., a rather low-end novelty shop. Their crisis is that one of them has killed their boss. Murder? Well, that's debatable. I can't find the quote I am looking for but I believe one of the characters says, approximately, "The first few blows could be self-defense, but the next half dozen were purely recreational." The ringleader is June who proudly says that her siblings call her "the coldest June on record." She and her co-workers decide that they can keep the store open for a while, bringing in a few precious weeks' wages. All they have to do is find a place to hide the body. And find the boss's hidden money. And avoid the cops. And oh yes, the blackmailer. It all gets rather complicated. And hilarious. 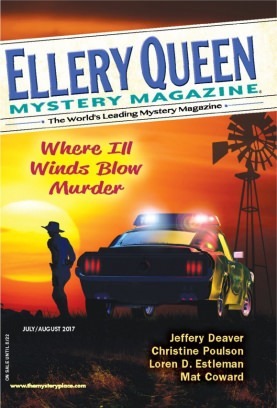 "Hard to Get," by Jeffery Deaver, in Ellery Queen's Mystery Magazine, July/August 2017. It's a classic concept of the espionage story: an amateur is forced to into the spy game to play against the deadly professionals. In Deaver's variation Albert Lessing is not a complete amateur. He is an analyst for the CIA; a desk jockey. But when an agent dies in an accident while preparing for a vital mission, Lessing is the only person with the language and academic abilities to fill the gap. And Lessing turns out to be very good at this new trade. Or is he? Or isn't he? As in a lot of the best spy stories its hard to tell for a while. And there are plenty of plot twists, one of which made me laugh out loud. A most enjoyable trip through eastern Europe. 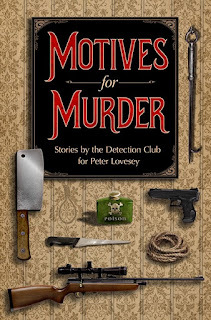 The Macavity Awards are nominated by members of Mystery Readers International, subscribers to Mystery Readers Journal and friends of MRI. The winners will be announced at opening ceremonies at Bouchercon in Toronto, Thursday, October 12. Congratulations to all. If you're a member of MRI or a subscriber to MRJ or a friend of MRI, you will receive a ballot on August 1, so get reading. To check if you're eligible to vote, leave a comment below with your email. 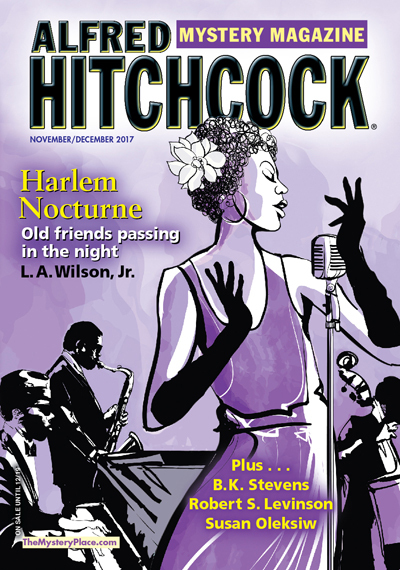 "Pain-Man," by Bev Vincent, in Alfred Hitchcock's Mystery Magazine, July/August 2017. Last week, a long novella about drug deals, car thefts, and murder in specific rural landscape. This week a short, funny tale of a Walter Mitty-type in Boston. You never know where the pursuit of the Best of the Week will take you. Raymond is a widower, pushing sixty, and waking up with new aches and complaints everyday. One day he blundeers into a bank robbery and is both injured and humiliated by one of the robbers. So Raymond decides to become a superhero. Naturally. We then follow his training regime, his setbacks, and Pain-Man's eventual rematch with his nemesis. Read the story. It will take your mind off your aches and ouchies. "Short Story," by Karin Slaughter and Michael Koryta, in Matchup, edited by Lee Child, Simon and Schuster, 2017. I'm not a big fan of thriller novels, but there are a bunch of terrific stories in this book. 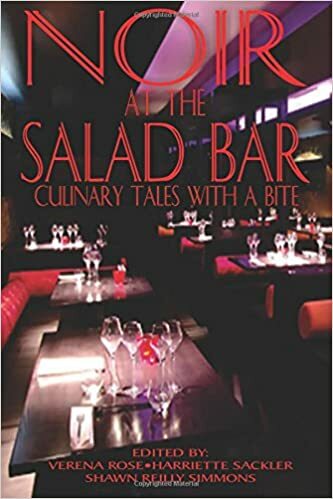 The gimmick is that each story features two members of the International Thriller Writers, one male and one female, bringing their most popular characters together. 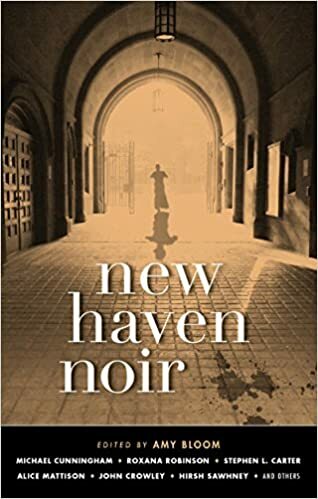 In this case it is Karin Slaughter and Michael Koryta (making his second appearance in this space) and they decided to dive into their protagonists' backstories. It's 1993 and Jeffrey Tolliver, is a young Birmingham cop. He is in a small town in Georgia on a long weekend that has gone terribly wrong. "Holy crap,mister. You're in your underwear." "Running shorts," he said, resisting the urge to cover himself. "Training for a marathon." That has a nice Groucho Marx surrealism to it, doesn't it? And pretty soon Tolliver is in jail on suspicion of murder. "This ain't no Batman movie, mister. I don't got to explain myself." "Summer of the Seventeen Poll," by Aoife Clifford, in Ellery Queen's Mystery Magazine, May/June 2017. I like stories of political intrigue (insert joke about current events here). But I am not used to them taking a noir tone. ...dawn broke as gently as a politician's promise. The narrator who gave us that lovely line is Callan Valient, an operative for the Labor Party in the Australian state of Victoria. Please don't insult her by calling her a spin doctor. You see, I'm a "smokejumper." I get the first phone call from the powers that be, even before they press "s" for spin. To be able to spin, you need to how the truth. I find that out, and then it's someone else's job to ensure the public never does. Valient and her boss, Roland "Stainless" Gesink, have their work cut out for them as most of the suspects have the last name Prendergast. The solution is quite a surprise. 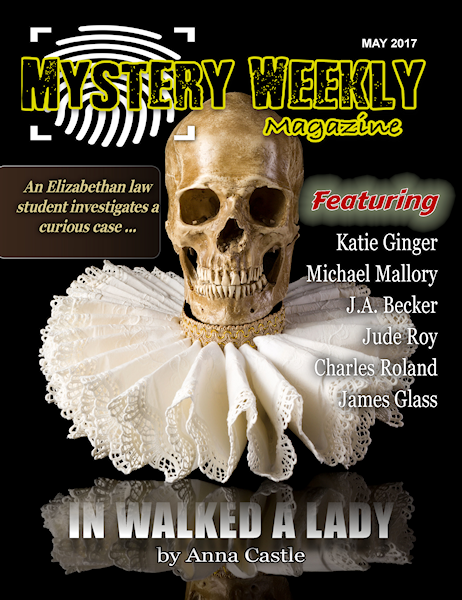 "Rosalie Marx in Missing," by Robert S. Levinson, in Ellery Queen's Mystery Magazine, May/June 2017. This is the second time Levinson has made it into my column. A lot of his stories are about fixers in Hollywood in the Studio Era. This time we go to Las Vegas and the 1970s. Vincent Riverbend is a private eye who works with Joyce Ryan, the daughter of his late partner from his days as a cop. And their client is a casino mobster named Nick Simone. Not the ideal customer but he wanted them so they didn't have much choice: "Simone wasn't somebody who ever took no for an answer. Ask anyone who tried it, if you can find them." Turns out the granddaughter of Simone's boss has been performing at the casino. Turns out she's gone missing. And if Riverbend and Ryan can't get her back a whole lot of nasty thugs are going to be upset. But life is not that simple. There are wheels within wheels, and when the roulette wheel stops spinning there will be a lot of surprises. Very satisfying tale.